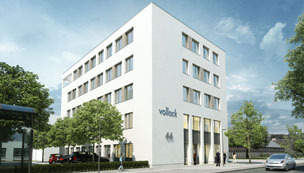 The B1 office and laboratory building erected by Vollack Berlin/Brandenburg at the business park “Am Oktogon”, which is partly used by the company itself, is the first building in the Adlershof technology cluster to be awarded the prestigious LEED Gold certificate. The five-story building by Berlin-based project developer immobilien-experten-ag (immexa) at Rudower Chaussee has a rental space of around 2,200 square meters. 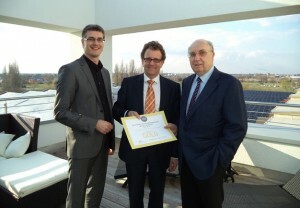 The certificate was presented in the soaring heights of the building’s roof terrace. The Leadership in Energy and Environmental Design (LEED) certification of the U.S. Green Building Council was developed in 1998 and is a system for classifying environmentally friendly construction projects. The criteria of the certificate assess the rental property as a whole, from how well it can be accessed by public transport, through to evidence regarding healthy room air, energy efficiency of the building envelope and the technical installations. Ongoing utility costs are up to 20 percent lower for LEED-certified buildings compared to non-certified buildings.